The Welcome Trust’s 2011 report ‘Exploring young people’s views on Science Education’ produced a number of important findings which we have found useful in setting the tone, direction and approaches of the Think Physics project. 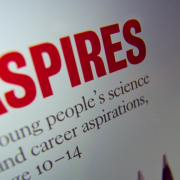 The study aimed to ‘Explore and understand better the attitudes to science education of young people aged between 14 – 18 years, with particular reference to: the value young people place on science education themselves as individuals and society in general, the key factors determining young people’s continuing engagement with both formal and informal science education’. The study gathered case studies from 240 secondary school pupils. The researchers also interviewed twenty young people aged 16 who had left education. Almost two-thirds of participants found science lessons “fairly” or “very” interesting, and a staggering 90 per cent felt that compulsory teaching of science in school up to age sixteen was important. Young people expressed a preference for more practical, hands-on activities which they believed made learning science more interesting and easier to understand. Pupils clearly want their science lessons to be more relevant to the real world, but almost 40 per cent of those surveyed had difficulties in making direct links between what they learn in the classroom and how they apply this to everyday situations. Young people would welcome a greater and earlier emphasis on careers guidance. The majority of young people thought that science related careers could provide rewarding employment, although pupils were only able to name a fairly limited range of possible STEM jobs. Of particular interest to the Think Physics project is the Wellcome Trust’s findings on careers and careers education. Think Physics agrees that careers messages should start early and we are working within our partner schools to embed careers messages within science (and STEM) from the Early Years and Foundation Stage. We’re working with nursery teachers and pre-schoolers to bring newly developed careers loan boxes into their classrooms. Careers loan boxes are a box of (fairly) easily transportable ideas, resources and equipment (including role play costumes and activities, educational toys and games, related books and careers cards) that will introduce pre-schoolers to a range of different jobs within a particular STEM topic through play. We started with a Space Loans box and then worked with ESH to produce a Construction Loans Box. This concept has proven popular with schools and we are looking to develop a Civil Engineering loans box very soon. Our primary careers workshops introduce pupils to a wider range of STEM jobs from the outset, in fact, we embed careers ideas into every engagement that we have. In our Meterorites workshop pupils explore what it is like to work as a geologist; in our Volcanoes workshop they get to try being a volcanologist; in our bridge building workshop they work as Civil Engineers. We also offer a selection of primary careers assemblies, and are not afraid to teach primary 5 all about biomedical scientists. Think Physics complements the careers advice around STEM currently offered in our partner schools. We work with Science Teachers, Maths Teachers, Design Technology teachers, careers staff and school librarians to encourage a holistic approach to STEM careers provision. We provide support for key transitions in a child’s journey, attending Choices evenings, providing Careers assemblies for Year 9s and Year 11s, and offering tailor-made careers workshops. An online careers provision (due to launch soon) will support in-school learning via a digital careers presence where pupils can explore case studies of young people interested in physics, undergraduates studying physics at University, those modern apprenticeships in Engineering as well as a multitude of people working within STEM Careers in the North East and further afield. 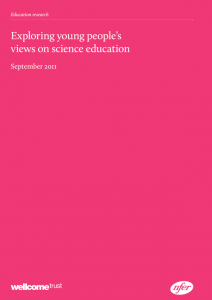 The full 2011 research report, Exploring Young People’s Views on Science Education, conducted for the Wellcome Trust by the National Foundation for Educational Research (2011), can be viewed at: www.wellcome.ac.uk/ About-us/Publications/Reports/Education. NUSTEM Reading List What is Science Capital?